One of the characteristics of film comedy all over the world is that it sets out to reflect the manners and mores of contemporary life. Much less frequently, it "dresses up," that is puts on the clothes and fashions of other periods, of times past. And yet in the Italian cinema, so bound up with contemporary events, a fondness for looking back and for resorting to humor to recount stories of distant centuries, pops up frequently. 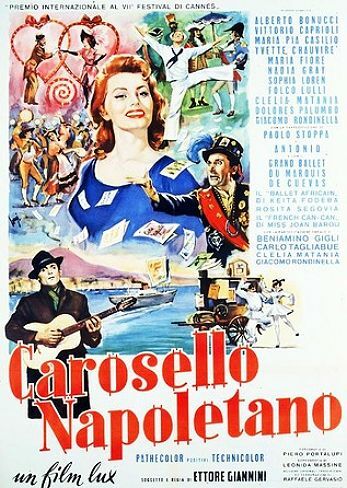 The most magnificent result in this direction, from a point of view of sheer spectacle, is probably to be found in CAROSELLO NAPOLETANO (NEAPOLITAN CAROUSEL) which in 1954 Ettore Giannini based on the stage production he toured all over Europe, without confining himself, however, to making simply a filmed version. The typical ingredients of the musical revue - dance numbers, songs, comic sketches - are interwoven with characters of a certain psychological and human consistency, typical of the comedy (suffice it to remember the family of poor storytellers which represents the connecting thread of the film), giving rise to a firmly unified whole that remains unique in Italian cinema: a sort of cavalcade through the history of Naples, between the little satirical footnote and the fervent epic saga, between anecdote, history, myth and legend. Actors like Sophia Loren and Paolo Stoppa, ballet dancers like Ludmilla Tcherina and Leonide Massine and the voices of opera singers like Beniamino Gigli alternate in a lively play of lights, colors, words and music.